The first Legal Futures From Click 2 Client Conference (sponsored by NatWest and mmadigital) took place last year and I was privileged to be invited to speak at it on the topic of making the best of social media. I thoroughly enjoyed that conference and returned to this year’s event as an eager delegate. I have been a bit critical of late of legal technology and legal futurist conferences that are looking far into the future and not concentrating on what can actually be achieved by law firms here and now. 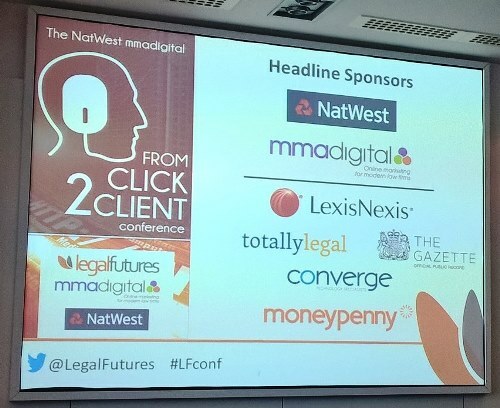 It is refreshing therefore to see the programme for Legal Futures’ next event: The NatWest mmadigital From Click to Client Conference … when you look at the line up it is on the whole real coal face practitioners who have actually been using online technology to improve their businesses. Other lawyers can learn a lot from these pioneers. It is not pie in the sky stuff about what we might or might not be doing in 2034 (I hope to have retired by then!). Again this was thankfully true of this year’s conference on 7th July which had the tagline “how to win business online”. Other legal conference organisers could learn a thing or two from Neil Rose on how to programme an enjoyable, practical and thought provoking conference. One that undoubtedly gives those attending real life examples of what they can actually implement to improve their law firms. 2020 might see us back in recession. 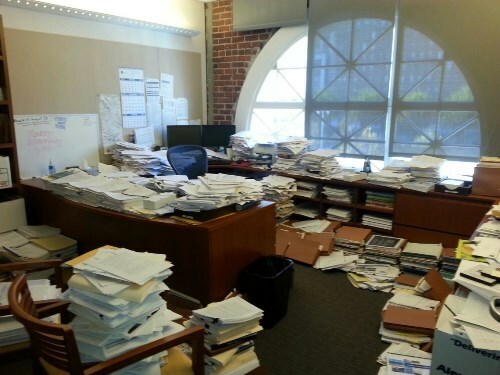 Window of opportunity for law firms before that. Confidence now strong. Only thing in life that is constant is change. 37% of global search is on games console. Leveraging memorability important in legal marketing. Trust and recognition drives performance metrics. Social media increasingly important for new leads. Overtaken digital display marketing. Customers won’t excuse you for being a law firm! 75% of all support contacts on Kindle Fire are through ‘Mayday’. Resistance to video chat is dropping all the time. Video chat good for some things but not all. Maybe initial meetings and co-browsing to better explain things? (I will be looking at video chat in more detail in a future post on this blog). Video ‘how to’ guides becoming very popular on the web for all sorts of things. Myhomemove = 21 days faster than competition in progressing conveyancing transactions. Shift from online ‘processing’ to online ‘engagement’. Development of mobile applications must include many things that you wouldn’t conventionally expect mobile to be used for. Websites must grab attention quickly. DIY not a good idea. Constant review and update necessary. Importance now placed by Google on responsive sites. No point competing in main arena with big boys in personal injury for Adwords. Would need millions of pounds. Instead go niche. If you compete using your local area, you can have the opportunity of showing on search results. If a small practice then concentrate on your locality for search terms. Significant parts of the market prefer local services over national ones. Cost of advertising on Facebook is low and can be very targeted. Customers expectations have changed: want it to be simple, whenever they want, wherever they want and they won’t waste their time. Why aren’t you more proactive? The way successful companies do business has changed too: easy to deal with, great customer experience, innovation, consumer centric. Develop your services for the platforms your customers use. RBS first UK bank to offer TouchID. Add little things to improve customer service and experience. To create the right services in a digital world, you need to adapt the way you work: Test and learn, design thinking, functions, talent, culture, operating model, digital transformation, breaking silos. It’s not only about digital channels but brand. Focus on what matters: helping customers with their needs. Trust is earned by informed service. Reviews important for feedback and information. Helps enhance your service. So a lot of useful stuff packed into that first session. We then had a commercial break when we heard from the conference sponsors. Converge also provided Champagne and Strawberries to all delegates that wanted some during the lunch time break, which was a very nice touch. 50% of users are watching business videos online. UK consumers are used to watching good quality content. Facebook are introducing video this year. Publishers want more sales but the user wants engaging, persuasive content. You need to strike a balance: Avoid direct ‘sales pitch’, identify/satisfy user need state and produce great content, built from the user’s objectives. Top 5 tips: (1) Budget (agree the cost and be honest with the resource you can commit), (2) Good Quality (lighting, angles and sound are key to good production), (3) Create for Need State (content that will engage your audience), (4) Why (If audience get why you do what you do, they will buy into you more), (4) Length is not important (concentrate on creating engaging, quality content that your audience will love!). Purpose of video varies: to educate, to provide self help, to provide reassurance during the ‘buying process’. You can spend £1 a day on Facebook advertising and still get results. Twitter targeting has come on leaps and bounds… you can now even target users who are watching specific TV shows. Retargeting pulls back lost customers, raises brand awareness, hits the perfect audience. Tone of voice needs to be different on different social media platforms. What is the key to going viral: emotion, social proof, practical value, stories. Also rich media, trending topics, humour, shock, influencers and a little bit of luck! what you should post on social media: 30% owned, 60% curated, 10% professional. Simplifying contact forms can increase completion of them. Top tips: Page loading time, don’t force unnecessary steps, content length, add video and optimise for mobile. But I thought that length does really matter and that video could have been a tad shorter and still conveyed the same message. I have looked at videos by lawyers before on this blog with specific reference to QualitySolicitors TV advertising. Before we broke for lunch Neil Rose pointed out that the more successful law firms use external advisers. Then it was time for a very nice lunch washed down with some of that Champagne courtesy of Converge! Duncan introduced us to a simple framework for thinking about client journeys, your content, marketing and measurement of success. You need to see, think, do and care. There is a risk, however, of putting so much effort into getting the phone to ring in the first place [what all the previous sessions were all about] that not enough focus is placed on what to do when a member of staff picks up the receiver. In 39% of all calls nobody was immediately available. 48% of call handlers failed to introduce themselves. In over a third of all calls neither party knew who they were talking to! 12% of calls never got past switchboard – with the switchboard often providing a quote. In 87% of all calls there was no attempt at any rapport or conversation. Only 19% offered a written follow up and 38% broke their promise or sent a poor response. In 97% of all calls the call handler did not ask the caller if they would like to go ahead! In discussions with law firms over these issues 90% of call handlers admit that they either don’t actively like handling enquiries or are not very good at it. 85% of law firms have not given call handlers any relevant training. Ian Cooper has developed a five step system to counter these issues which really involves doing all the things many of the call handlers did not do in the above examples. Even once a client is signed up, it will be of no surprise to anyone here to learn that some firms could improve the way they handle this fragile relationship, and we will finish the day with a panel who will provide insight into current best practice. Smart working is about being where your client wants you to be. Smart firms are focused on giving the client what they genuinely want and not what the firm thinks they should get. Ed Fletcher of Fletchers compared client satisfaction to satisfying your wife! You think she is satisfied with you but she probably isn’t. Think about that analogy the next time you are providing a legal service to your clients. Joanna Swash of Moneypenny told us about the little things that matter to employees: At Moneypenny they increase employee satisfaction with an ice cream van in their car park on a hot day. At Inksters we have Pinkster Gin at 5pm on the last Friday of every month! On the topic of gin the conference came to a close with a networking drinks reception. As always a good time to catch up with contacts old and new. For my next trick I will shuffle my iPad! 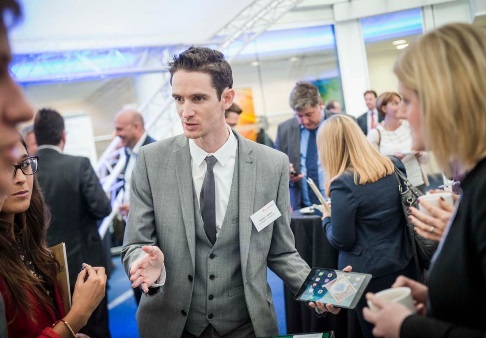 Last year Legal Futures had a digital magician at the Click 2 Client conference. That was fun. I hope they bring him back next year. Do look out for next year’s Click 2 Client conference which I hope will happen. It really is a conference packed with insights and ideas for today. It is not to be mistaken for the futurist legal conferences that are more about life on Mars than how to actually win business online now. David Gilroy on 14/07/2015 at 11:37 pm. Brian Inkster on 14/07/2015 at 11:55 pm. Thanks for the link to your original source material that was used/referred to in the Legal Cheek link I found. The comments to your original post make interesting/amusing reading. David Gilroy on 15/07/2015 at 7:45 am. Brian, I think the LegalCheek interpretation is hysterical. Made me laugh all over again when reading it last night!